Is The Cost of BioHorizon Dental Implants Worth It? For most individuals BioHorizons dental implants are a good investment. The long-term cost is much less than that of other dental treatments. The technology used in BioHorizons dental implants ensures that they will be secure, attractive, and likely last a lifetime. Once they have been fit and customized for your smile, you will not need follow-up work. BioHorizons implants also have a higher success rate than average dental implants. With crowns and bridges, healthy teeth are often ground down, bone loss occurs under the bridge, and individuals are at a greater risk for cavities, gum disease, and dental problems. This can add up to substantial costs over time. Leaving teeth untreated or wearing partial or full dentures also leads to bone loss and dental issues. Crowns, bridges, and dentures will typically need to be replaced every ten years. BioHorizons dental implants are the most cost-efficient option over the long run. They help you to maintain dental health and dental restorations over the course of a lifetime. The benefits of BioHorizons dental implants far outweigh any initial costs. How Do BioHorizon Dental Implants Work? For your convenience Dr. David Tai performs both the surgical procedures and the restorative phase in one office. The BioHorizons dental implants are placed in a similar fashion to traditional dental implants. At your initial office visit, Dr. Tai will take x-rays, perform diagnostic tests, and create a model of your remaining teeth to establish the correct implant placement. After analyzing the results, it will be determined if bone grafts are needed to build up bone volume for implant positioning. If bone grafts are not necessary, the patient is ready for the placement procedure. This is generally done under a local anesthetic or sedation, so that the procedure is pain-free. To expose the jaw bone, Dr. Tai will make an incision in the gum tissue. A small hole will be drilled into the jaw so that the implant can be placed securely. 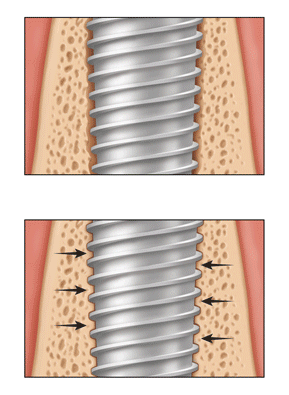 Dr. Tai will screw the implant post into position, cover it with a temporary cap, and close the area with sutures. The sutures will be removed and healing will be assessed. Post-implant placement dental hygiene is essential while the area fully heals. Following a healing period of about three to six months, Dr. Tai will schedule you for the next surgical step. Under local anesthetic, an incision will be made at the site to expose the implant and the temporary cap will be removed. An abutment will be attached. In some cases, you may receive a temporary crown on the day of implant placement. After the bone and soft tissue heal, the restorative phase commences. You will undergo an impression and fitting for the new prostheses, typically a crown. The prostheses will then be screwed into the abutment reviving your natural smile for life. Are BioHorizons Dental Implants Safe? Yes. BioHorizons Dental Implants are safe. In fact, approximately 99.2-percent of BioHorizons procedures are successful. Dental implants are considered one of the safest and most successful implantable medical devices. Observing proper dental hygiene will ensure that the area heals properly without complications. It is essential to follow Dr. Tai’s treatment plan to make the process as effective and painless as possible. Why Choose BioHorizons Over Other Dental Implants? In order to best restore your smile and maintain the esthetic effects of dental implants, it is essential to create stability in the bone-soft tissue complex. The longevity of dental implants is highly dependent on the integration of the implant with the hard and soft tissue. Traditional dental implants notoriously result in a what is known as crestal bone loss over a period of time. While the roughened surfaces of dental implants can increase the surface area of bone attachments, they have little effect on soft tissue. •	Multiple implants can be placed in a single visit. •	Prevention of gum recession. •	Maintains bone and facial structure. Am I A Candidate for BioHorizon Dental Implants? The majority of adults can undergo the BioHorizons implant procedure. Adolescents may be eligible in certain circumstances if their facial structure has matured. If you are missing some or all of your teeth, or currently wear a full or partial denture, BioHorizons dental implants may be the ideal option for you. Those with adequate bone density who are healthy, not prone to infection, and maintain good oral hygiene are the best candidates. It is important to discuss the risks and benefits with Dr. Tai to determine if BioHorizons dental implants are an appropriate treatment. What are BioHorizon Dental Implants? BioHorizons dental implants are an innovative new form of tooth replacement. These dental implants work like traditional implants, yet feature proprietary Laser-Lok technology. They are lightweight, biocompatible, titanium implants that will secure prostheses that look and feel like your natural teeth. The dental implants are embedded into the bone, abutments are attached to the implant, and then prostheses, usually in the form of crowns, are secured. BioHorizons dental implants differ from other dental implants because the cone-shaped screw has microengineered grooves that provide an attachment surface for both bone and connective tissue. While traditional implants cannot form a solid attachment to soft tissue, BioHorizons dental implants provide both bone and soft tissue stability through a bone-bonding component. This prevents bone loss and results in stable implants that will last a lifetime. The replacement of missing or severely decayed teeth with prosthodontic reconstruction is our specialty. Teeth can be replaced by many different means and combinations of techniques, such as crowns, non-removable bridges, removable partial dentures or implant supported permanent teeth. The rebuilding of a smile often requires a blend of these options. 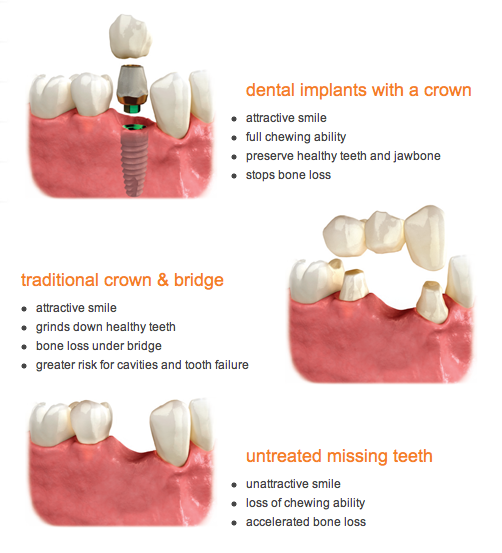 Our traditional single crowns and bridges are custom designed to match all proportions of adjacent natural teeth. Porcelain is custom colored and shaped in our laboratory to offer each patient a distinctive prosthetic restoration. Crowns are restorations that cover or cap teeth, restoring them to their natural size, shape, and color. with natural looking nonremovable replacement. It can eliminate unsightly gaps by extending or “bridging” a replacement tooth between the teeth on either side of the gap. Are Dentures a Good Solution to Missing Teeth? A removable prosthesis, such as customized complete dentures, can restore function and appearance in the mouth as well as the surrounding facial tissues. If several teeth can be saved, dentures may be made to fit over the roots of these teeth. The “overdentures” preserve bone and greatly increase denture stability. In many individuals, dental implants can offer a patient an overdenture with far more stability that traditional dentures. More importantly, patients who have had dentures can enjoy non-removable replacement teeth, built upon implants. These function as well as, and sometimes better than, the original natural teeth. Aside from the obvious effects that missing teeth can have on personal appearance, there are other more serious consequences. When a tooth is lost, as space is created. Normal oral pressures and stress can cause the remaining teeth to shift. This shift can cause healthy, straight teeth to tilt and become unstable, leading to even more tooth loss. Also, the teeth support facial tissue. When gaps are left unrepaired, the tissue “caves in”. This can add years to the person’s appearance. Long-term success of implants depends on how well they are maintained. Regular dental visits are essential. Your dentist will develop a dental visit program to ensure the health of your implants and remaining natural teeth. Periodontal disease can strike when teeth and gums are not properly cleaned. If left untreated bone loss, which weakens supporting structures, can lead to loss of dental implants as well as tooth loss. Home Care: Daily brushing and flossing are absolutely necessary for long-term success. There are also many supplemental products that allow you to clean the implants properly. Your dentist will design a home care regime that will suit your individual needs. Brushing: Your dentist may recommend a cordless electric toothbrush. Whether you use a standard brush or electric toothbrush, your dentist and hygienist will review your brushing techniques to ensure that you are cleaning the area properly. Oral Irrigation Systems: Research has shown that oral irrigation is effective in reducing plaque accumulation around dental implants and natural teeth. Your dentist may also suggest that you use a special mouth rinse. Flossing: Good home care includes daily flossing. Floss threaders are very helpful in allowing you to reach around implants, under bridges and bars so these areas can be easily cleaned. Your dentist may also recommend special types of floss. Interproximal Brushes: These small dental brushes, also called “Proxy Brushes”, are specifically designed to clean between the teeth and implants. While not a replacement for dental floss they are helpful in cleaning hard to reach areas. Dental Visits: It is typically recommended that patients visit their dentist for professional cleanings every 3-6 months. However, your dentist will design a dental visit program specifically for you. How Successfull Is Treatment With Dental Implants? Research and documentation studies have proven the effectiveness and long lasting results of dental implants. Dental implants have demonstrated a success rate of over 95% in documented studies. Good oral hygiene is one of the most critical factors to insure the health of your dental implants. Our dentist will instruct you on the proper home hygiene procedures to keep your dental implants and remaining teeth clean and healthy. Regular visits to your dentist are important so we can assess the health of your replacement teeth and gum tissue. You can rely on your replacement teeth to look, feel and function like natural teeth for years to come. Osseointegrated dental implants are the state of the art in modern dentistry. They are small titanium “fixtures” that take the place of the natural root of the tooth. Gently implanted into the bone, using local anesthesia, these very tiny titanium roots actually bond or integrate with a patient’s bone. 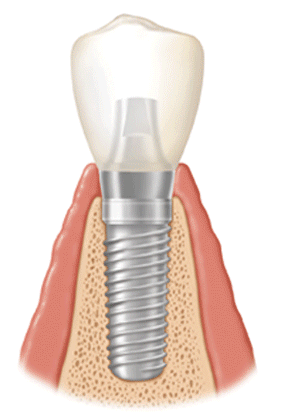 Very often, the osseointegrated implant is more stable than a natural tooth’s root. A prosthodontist can build permanent teeth, custom designed and shaded to aesthetically suit each patient’s distinctive facial requirements on these implants. Scientific research for more than three decades in the United States and abroad has recognized titanium for its biological compatibility with the human body. Studies have shown that the earliest patients treated with these modern osseointegrated implants continue to enjoy healthy, stable smiles. Prosthodontics is the dental specialty responsible for the diagnosis, treatment planning, rehabilitation and maintenance of patients using biocompatible substitutes, including implants, to replace missing or deficient teeth and/or craniofacial tissues. Prosthodontics is one of the nine dental specialties recognized by the American Dental Association (ADA). A Prosthodontist specializes in restoring natural teeth and creating and placing natural looking substitute or prosthetic teeth. Today, a Prosthodontist’s professional education includes several years of additional university training after dental school. In British Columbia, a Prosthodontist is a dentist who has satisfied the specialty examination process conducted by the College of Dental Surgeons of British Columbia allowing that dentist to be a “Certified Specialist in Prosthodontics”. Prosthodontists are trained in state-of-the-art techniques and procedures for treating many diverse and complex dental conditions and restoring optimum function and esthetics. These include: crowns, bridges, complete and removable partial dentures,dental implants, TMD-jaw joint problems, traumatic injuries to the mouth’s structures and/or teeth, snoring or sleep disorders and oral cancer reconstruction and continuing care. Nearly all implant procedures are performed with local anesthesia in a comfortable dental chair. No pain is felt during the surgical procedures. Depending upon the number of implants placed, there may be swelling and/or tenderness for a few days following the surgery. Pain medication is usually prescribed which alleviates this discomfort. Patients generally prefer a soft foods for the healing period following surgery. Cold foods and tepid soups are suggested, as they aid in reducing swelling. The entire osseointegration process and the building of the new teeth can be accomplished in as little as three months, though the upper teeth or replacing a complete denture with permanent teeth normally requires five to six months. A dental implant is a titanium fixture that serves as a replacement for the root portion of a missing natural tooth. 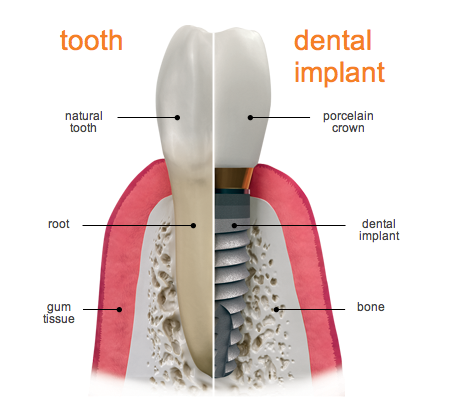 The dental implant placed in the bone functions as an anchor for the replacement tooth. Once the implant is integrated into the bone, crowns, bridgework or dentures can be secured onto these anchors. The treatment process is done in two stages. First, the implant is placed in a simple surgical procedure. After a waiting period of 4-6 months to allow the bone to heal, a simple second stage surgery is done to expose the covered implants. 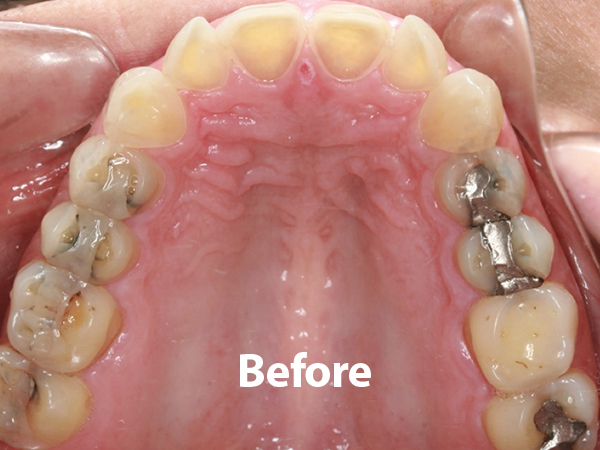 The restorative treatment will follow with impression and fitting of the prostheses. 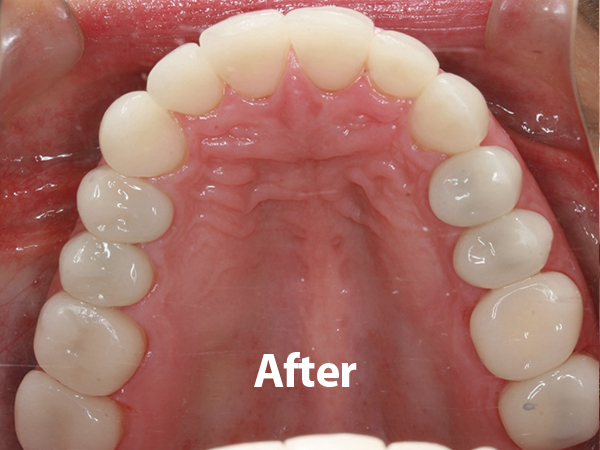 In the past a patient missing a single tooth would often receive a fixed bridge where the teeth on either side of the space are prepared for crowns and a false tooth suspended between them. With today’s technology the patient is ideally treated by a crown supported by a dental implant, avoiding any compromise to the other teeth. Dental implants are the ultimate solution for young people with congenitally missing teeth such as lateral incisors. Dental implants can also replace multiple missing teeth which are traditionally replaced by a removable partial denture. Occasionally dental implants can act as anchors for a fixed bridge to replace the teeth making the removable partial denture obsolete. In some cases there are too many teeth missing to use a fixed bridge; however, using a dental implant with an attachment that snaps into the removable partial denture will significantly improve its stability and improve the patient’s chewing function. Perhaps the best known use of dental implants is treating patients without any teeth. Denture wearers often suffer due to loose and “floating” dentures, and dental implants offer many benefits to patients without teeth. Stability of the dentures is improved with the use of even two dental implants with attachments, but greater satisfaction is achieved as the number of dental implants is increased. Depending on the number of dental implants utilized to replace the teeth a denture can be made that clips onto a bar supported by the dental implants or a fixed denture that remains in the mouth can be attached to the dental implants. Dental implants also can help preserve the patient’s jaw bone and retard the shrinking of the jaw that is routinely seen in long-term denture wearers.